Clutch slipping, dragging or juddering are all indications of problems within the clutch. If you're having difficulty changing gears or putting the bike into neutral, this can also be a sign that something is wrong. The problem could be anything, from an incorrectly adjusted clutch; too worn or warped plates; too heavy or the wrong quantity of oil, if using a hydraulic system; to incorrect tension in the cable. Always check that plates and springs are to the correct specification, by measuring the stack height of the plates or the length of the springs. This can be checked against your owner's manual. Clutch friction plates are the most commonly replaced clutch parts. Most of them will require soaking in oil overnight before fitting. If the correct 'stack height' has not been attained by replacing the friction plates, the spacer plates may be worn and also need replacing. Wemoto stocks only steel spacer plates, which offer greater lifespan and wear resistance than alloy plates. It is always best to fit new clutch springs each time the clutch is changed due to heat fatigue of the old unit. You might as well change them when the clutch is open anyway, as they're cheap enough and it will save you the hassle of doing it another time. Heavy-duty clutch springs are often recommended but may increase lever pressure required to operate the clutch. Make sure you are comfortable with new settings and can easily disengage the clutch with minimal hand pressure. Wemoto stocks friction plate, steel plate, kevlar plate and spring kits - all containing the exact number and specifications for each fitment. All clutch plates are of the correct size and thickness to rebuild to the original stack height, and can be used with the original equipment clutch basket, inner hub and pressure plate. 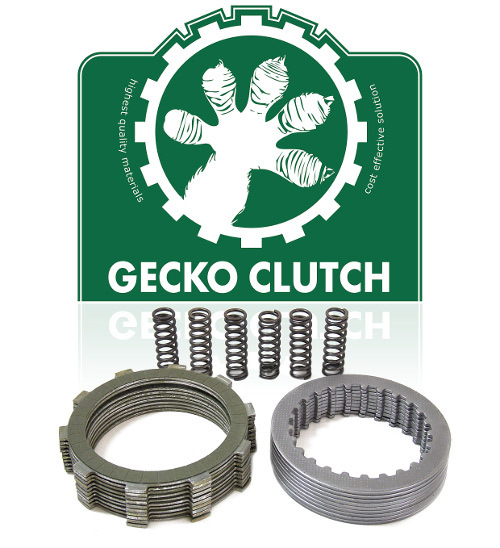 Wemoto recommend Gecko clutch kits for their great quality with exceptional value.